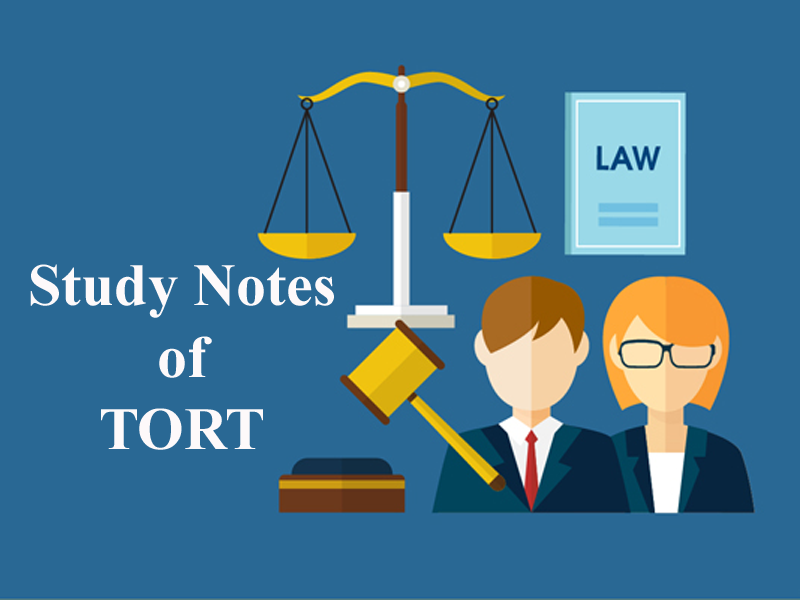 Here we are providing you updated and most relevant Study notes on Tort of Introduction to Law of Torts for Law Entrance Exam. These study notes are highly recommendable for all those who aspire to crack CLAT, DULLB, AILET and other Law Entrance Exam. The word tort is of French origin and has been derived from the Latin term ‘Tortum’. Tortum = To twist, a conduct which is tortious or twisted. The English word ‘wrong’ is also an appropriate term for tort. According to the legal system of our country wrongful acts can be widely classified in two categories i.e. Civil wrong and Criminal wrong. Tort falls in category of civil wrong, but not all civil wrongs are tort. Those civil wrongs which do not fit in any defined category of civil wrongs are torts. Every individual have certain legal rights and duties towards each other. These legal rights and legal duties correlate with each other. If any person infringes the legal right of other person that wrong may be called as tort. Example: Trespass to property, which means entering into the premises of some other person without seeking his permission. The Tort law is not codified. The Subject matter is classified in various branches. Tort is also called as an inanimate tree and its branches can be shown in the tree structure. In Tort the loss incurred by the other party is indemnified by the wrongdoer. The loss incurred is calculated in terms of monetary loss, loss of health and comfort. The essence of law of tort is if a person violates the legal rights vested in another person, then he has to compensate the other person for his wrongful act. Loss in monetary term is not essential, in fact only infringement of legal right will conclude in tort. Example: (a) ‘A’ has the right to cast vote and if ‘B’ without any lawful cause stops him to cast his vote it will result in a Tort. ‘A’ has a legal right to enjoy a pollution free environment and if ‘B’ causes any disturbance then it is a Tort. Tort is a civil wrong. It is redressible by an action for unliquidated damages. “Tortious liability arises from the breach of a duty primary fixed by the law this duty is towards the persons generally and its breach is redressible by an action for unliquidated damages”. “Tort is a civil wrong for which the remedy in a common law action for unliquidated damages and which is not exclusively the breach of a contract or the breach of a trust or other merely equitable obligation”. There must be a wrongful act or omission on the part of a person. That wrongful act or omission must result in legal damage to other. The wrongful act or omission must be of such a nature as to give rise to a legal remedy. (a) A person can be held liable if the person does not perform his legal duty or violates the legal rights of other person. Violation of moral, social or religious duty does not constitute tort. Example: (a) ‘A’ is a very good friend of ‘B’ and invites him for evening tea. B accepts it but in the evening he forgets to visit ‘A’s house. The question is whether ‘B’ committed a civil wrong or not? (b) ‘A’ does not save ‘B’ from drowning in spite of continuous calls made by ‘B’ here ‘A’ is a passerby or a visitor he is not a life guard? Do you think A has committed any civil wrong? Here rise two questions. Whether ‘A’ owes a legal duty to save ‘B’? Whether ‘A’ violates any legal right of ‘B’? (c) A family offers afternoon meal in a temple as a custom but stops doing it after sometime. Does it constitute any wrong? All the above examples are of social, moral and religious wrongs they are not Torts. Violation of legal right vested in the plaintiff. It is not essential that party suffers pecuniary loss; mere infringement of wrong doer leads to having to compensate the other party. There are two important legal maxims. Damnum – Damage in terms of comfort, money and health. Meaning there by Injuria sine Damnum i.e legal Injury without damage and on the other hand Damnum sine Injuria which means damage without legal Injury. In Torts Injuria sine damnun is compensable which means that compensation be awarded in this case but in damage without Injuria ie. Damnun sine Injuria no compensation is awarded. Where there is a right there is a remedy. It means if the plaintiff (Sufferer) has a right, he must get compensation. Malice and Motive and their role in Torts. In general there is no requirement of showing a mental element to prove a wrong in tort except in cases of malicious prosecution, assault, battery and false imprisonment. Mental element i.e. Malice is important here as it is one of the factors in enhancing the damages. The test is of ordinary prudence and standard of job required to be performed by the individual in circumstances. Example: – In tort of Negligence conduct of a person is very important. In this case, the plaintiff was a valid voter at a Parliamentary election. The defendant, the Returning Officer at a voting booth, wrongfully disallowed the plaintiff from exercising his franchise. Now, there was no loss, monetary or otherwise, suffered by the plaintiff. Even the candidate for whom, he wanted to vote, won the elections. Nevertheless, the plaintiff succeeded in his action against the defendant, for the simple reason that the Plaintiff’s legal right was violated. In this case an M.L.A. of the J.K. Assembly, the plaintiff was wrongfully arrested & detained by the police, while he was proceeding to the Assembly. Further, he was not produced before the Magistrate within the stipulated period. This act was a violation of both his fundamental and legal right. Finally it was held that the State was liable and was compelled to pay damages to Mr. Bhim Singh. In this case, the defendant, a school teacher set up a rival school in the same locality. As he charged low fees, students dropped out of plaintiff’s school and joined the defendant school; defendant had intended to cause wrongful loss to him. It was held that the plaintiff had no remedy, as there was no legal wrong committed by the defendant. Thus, in this case, you see that there is monetary loss to the plaintiff, but there has been no violation of his legal right. Hence, there is no case of tort. 3. Tort law is not codified. 5. A stops B from casting his vote in the elections. Will A succeed in an action against B? 8. If Rama invites her friend Priya for dinner but Priya doesn’t show up will it lead to a civil wrong? 9. If Ramesh sees Ashok drowning and despite of the calls for help doesn’t do anything. Will he be liable? 10. Rani gives money to the beggar on the street every day. She suddenly stops. Will she be liable? 11. What kind of wrongs are not Torts? 14. In Torts ________________ is compensable. Get the updated and most relevant study notes on Tort of Introduction to Law of Torts for upcoming CLAT and other Law Entrance Examination.